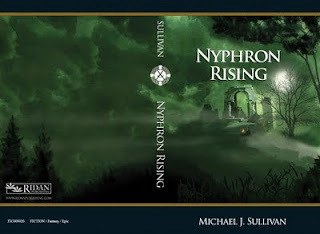 As we close in on the release date for Nyphron Rising things are taking shape. The cover art is just about finalized and so I can show it to you here. Some of you may have remembered a sketch I provided a few months ago however and wondered what happened to that idea. I completed that painting some time back, but was never completely happy with it. 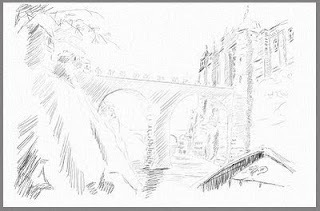 Both covers depict scenes from the novel but it was thought that the bridge image was harder to understand by the viewer. Also the general look of the bridge image failed to fit the pattern—it is just a bit too detailed of a scene lacking a central focus and less ethereal than the others. But mostly it was the color scheme that ultimately decided its fate. It was my intention to create the series using a different color scheme for each novel. I toyed with the idea of having each color match the season of the story. Crown Conspiracy takes place in the fall, hence the gold color. Avempartha was painted in a blue green for spring. Nyphron Rising takes place in the summer so green was the obvious choice. I doubt I can keep up this theme however. The next book, The Emerald Storm, takes place in autumn again, so I will be at a crossroads then as to what color to use. And of course there are only so many colors. Having completed both covers, I am interested to hear which you prefer. So leave a note here with your vote for your preference. It is not likely to change the choice, but I am curious to hear what readers think. Which cover do you like best? Which one looks the most intriguing—compelling? The plot of a novel is the story, how it is told is the style. Some books are plot-heavy, meaning that the focus is on an elaborate, usually fast-driving series of events. Others are style-heavy. Style comes in many varieties, some cleverly poetic in their prose, others place the weight of the story on the nuance of the characters, still others are setting-heavy. Combinations of various plot types and style types can keep each book—even by the same author—unique. There are also formulas to certain series. Developed by one author, the tradition is carried on by new writers who must follow a lengthy style guide. I once attempted to submit to one of these publications, namely Wizards of the Coast. I never heard back and today see that as a bullet dodged. The idea of being confined to a single specific style designed by another is a horror to me. Plot and style types I feel should follow the form of the book being written. A simple plot is bolstered and made engaging by a lively and elaborate prose style that employs a vibrant setting to create an experience that lets the reader taste the air and hear the wind. A complex plot however, would drown in a similar style. The average James Bond story, written in the beautiful manner of Suzanna Clark, would result in a tome of immense size and leave readers struggling to lift the important points. Plots with numerous characters, scene changes and actions I feel are best served with a simpler style that allow the reader to concentrate on events rather than the eloquence of the writing. In particularly tricky plots, even characterization can be simplified and revealed more through events than through lengthy reflection, the kind you find in your average Stephen King novel. I have written novels in numerous styles, and while I enjoy the fun of creating artwork in sentences, I’ve always found this best done in conjunction with simple plots. Most successful novels of this type cover scant ground in terms of story. Few events occur and a plot can be as simple as a man coming to grips with his impending death, yet the in-depth character study, palpable settings and writing style make the story just as griping as any action adventure. Still this kind of work is not usually found in fantasy. Stories in the realms of dragons, vampires, ghosts and knights rarely confine themselves to the minute and the diminutive. Imagine the Lord of the Rings written in the style of Stephen King, John Updike, James Joyce, or better yet, Shakespeare or Milton. Those who scorn the trilogy for its lengthy prose might then perceive the brevity of Tolkien. For this reason I have always advocated a lighter style for the traditional fantasy adventure as they are rarely of the ilk associated with sipping a glass of wine. Fantasy is like a drag-queen, grand and sweeping and adverse to the small, understated, or reflective. The Riyria Revelations was born out of my trying something new. Coming off a novel of deep prose, Riyria was a great leap to a story of simplicity. I had a huge story to tell, one of complex themes, numerous characters and dozens of twists where things are not always what they seem. This idea would be unmanageable in a thick style. I’m already asking a great deal of the reader—to keep track of everything that happens over the course of six separate novels as if they were one long book. To make the trip as comfortable as possible for my readers I attempted a style I had never tried before—invisibility. I thought I was a genius for inventing this concept only to learn later that I had discovered the light bulb in 2004. The idea is to make the story pop off the page and make the writing disappear. Neither awkward prose nor eloquent phrases should distract the reader from immersion in the action and the world unfolding before them. I have needed on many occasions to rewrite passages that were too pretty; too sophisticated for fear the reader would notice them and pause to reflect. The result I have discovered, much to my delight, is a book that reads like a movie in the reader’s mind. A number of people have posted reviews mentioning this very thing. When Crown was first sent to the publisher and handed over to the editors the one comment I heard was that they had a very difficult time working on the book. Immediately I guessed it was my bad grammar, (and I have reason to be concerned.) Yet I learned it was not due to a proliferation of mistakes but rather the addictiveness of the story that prevented the editors from concentrating on the words—words that kept “disappearing.” Those working on the text found themselves repeatedly caught up in the story. While this did not help the book, I did take it as a mark of success. So did the publisher who signed the second book even before the first hit the stores. This then is the “light-hand” approach that some of you have read about on my website. While I now know that I am not the first to employ it, it remains something of a rarity in the fantasy realm. While there are precious few writers penning speculative fiction in the style of Joyce or Marlow (although I have read some—most as yet unpublished,) few are willing to thin their styles beyond the traditional boundaries of the genre. For me this is a great disappointment, for while I enjoy a beautifully written novel—I love a great story. Robin looks up peering over the back of the laptop. I can only see her eyes and the bridge of her nose, but I can see the same forced innocence the dog manages when I catch it chewing a shoe. Nyphron Rising is deep in the final editing stage. I’ve personally gone over the book a dozen times. Robin went over it and asked for changes and now we are doing the polishing. Polishing is a nice word in English, it sounds pretty and conjures images of men in white gloves breathing on a tea set and rubbing it gently with a cotton cloth. In Elan it means every night in the Sullivan household is a re-enactment of the Lincoln-Douglas debates. The real fun starts when we come to a section that Robin did some “heavy editing” on, that is, she rewrote something. Robin is a good editor so most of the time her re-writes take a muddy paragraph and wipe it clear, but when she decides to actually create sections I get critical. When she writes character dialog I flip out. Now we can’t determine which of us changed. In The Crown Conspiracy she rewrote the entire scene just before the party entered Gutaria prison. Upon reading her revision, I backed all her changes out and rewrote the whole scene myself addressing the issues she highlighted. During Avempartha, I had fewer problems with her changes, and in Nyphron Rising she is experiencing an unprecedented freedom. She insists I’ve learned to trust her more, I insist she’s become a better editor/writer. 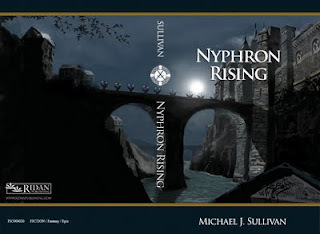 Nyphron Rising is undergoing the most thorough editing we’ve done to any of the previous books, and it is starting to show. The sentences are smoother, cleaner, and the plot tighter. A lot of this is thanks to the efforts of my wife who is willing to throw herself in the lion’s mouth. Nyphron Rising is going to be a much better novel because of her efforts. “Read it again,” I tell her. She does and I listen with my eyes closed picturing the scene, and Amilia’s face as she delivers the lines.